Nonin approached Snap Agency for help with designing and developing a fresh, user-focused website to drive sales and better reflect the brand’s identity. 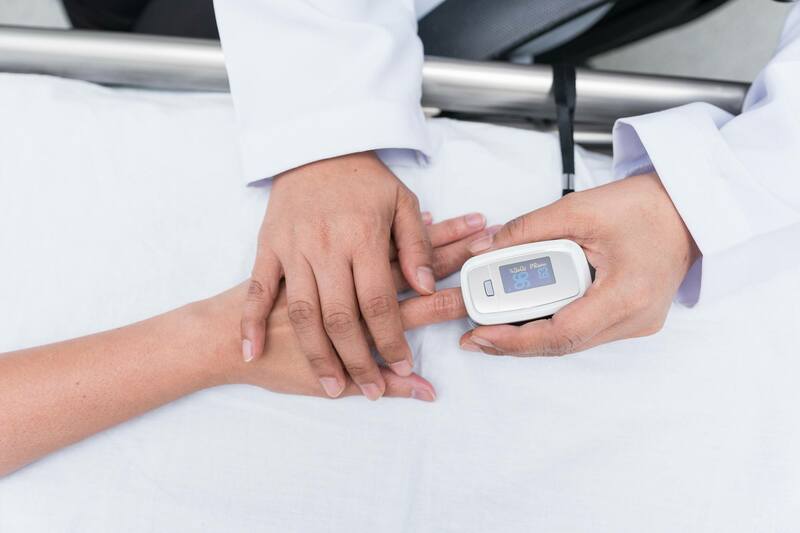 Nonin’s sales team needed an easy-to-use online platform to convey the superiority of their monitoring devices—and position Nonin as an industry leader users could count on. Following a major rebrand with a third party, Nonin asked us to assist them with building a website that would reflect and enhance their new look and messaging. At the onset of our partnership, we sat down with Nonin’s leadership to lock down a timeline and define expectations for the project. During this discussion, the client also asked us to assist their internal marketing team with understanding and executing a handful of key digital marketing initiatives, including attribution and quantification of effort. Determined to meet and exceed these goals, our team set to work on building a beautiful, intuitive site to support Nonin’s success. 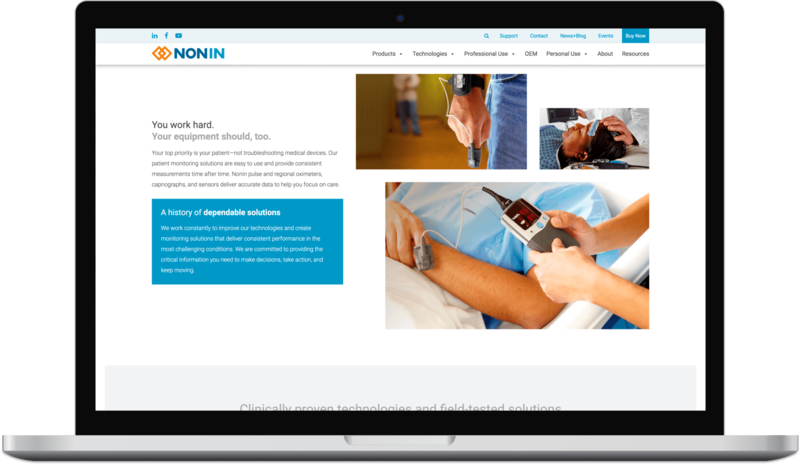 We started off by creating an impactful web design for Nonin. By working closely with their key stakeholders, our Design Team developed a deep understanding of Nonin’s ideal users. These insights played a vital role in the creation of detailed user personas—which informed every aspect of the site’s design and messaging. During this design process, our SEO Team performed keyword research and technical SEO for Nonin, ensuring their site’s success on leading search engines. Nonin’s responsive design provides a seamless UX that quickly guides users toward the ideal monitoring solution for their needs. Along with its appealing layout and improved navigation, the new site’s infrastructure accommodates a wide range of languages and currencies—both essential features to ensure sales growth in regions beyond the U.S. Our build also provides pragmatic automation for Nonin employees, making site administration and management simple. While our Development Team brought functionality to the new site, we collaborated with Nonin’s marketing experts to help them understand the best ways to manage it and make alterations—as well as track attribution, quantify effort and capitalize on customer touchpoints across their sales funnel. And after one last round of QA and approvals, we launched Nonin’s refined website into the world—generating major returns for the business. 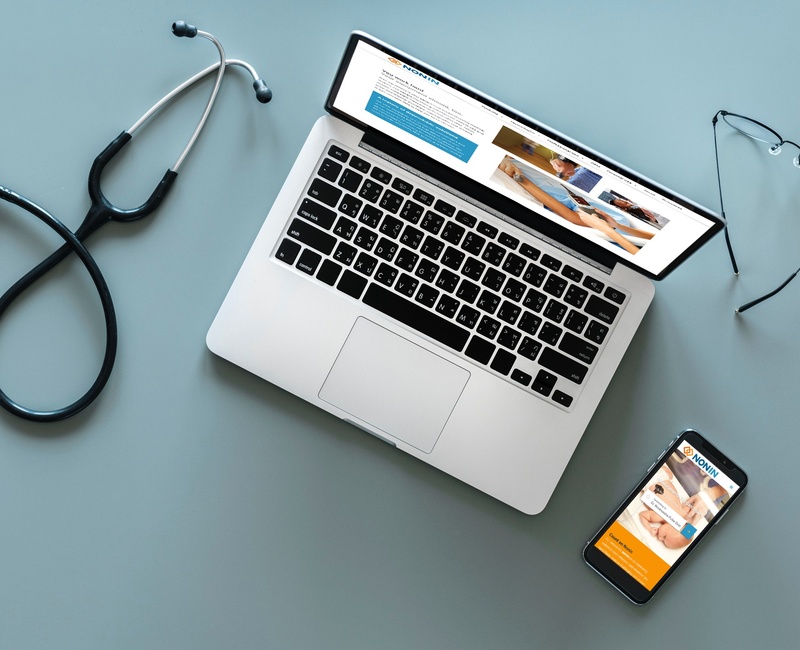 Thanks to their revitalized digital presence and marketing strategies, Nonin is connecting medical professionals and caretakers worldwide with the tools they need to provide the highest quality of patient care.